March 22, 2011 - Garmin International, a global leader in satellite navigation, and Kuerzi Avionics AG, an industry leader in helicopter and aircraft services in Europe, have teamed together to obtain European Aviation Safety Agency (EASA) certification for the installation of the Garmin G500H glass cockpit in the Eurocopter AS350. With this STC, any authorized Garmin aviation dealer can install a G500H in an AS350 in accordance with EASA guidelines. ?Kuerzi Avionics is very proud to have worked with Garmin to achieve the first G500H EASA STC certification,? said Ralf Kuerzi, Managing Director of Kuerzi Avionics. ?We have selected the G500H as we consider it to be the correct avionics solution to fulfil the requirements of our current and future customers.? ?The G500H is becoming a very popular avionics suite with the helicopter community because of its vast capability and flexibility,? said Gary Kelley, Garmin?s vice president of marketing. ?We are very pleased to work with Kuerzi on this STC and we believe the G500H is a great way to update AS350 helicopters so they can operate at a whole new level.? The G500H is an all-glass avionics system designed specifically for the VFR Part 27 helicopter market. The primary flight display (PFD) shows attitude, airspeed, vertical speed, altitude and course/heading information, and the multi-function display (MFD) has detailed moving map graphics with the helicopter?s current position in relation to terrain, chart data, navaids, and flight plan routings. The system offers features like helicopter synthetic vision technology (HSVT), XM WX Satellite Weather with NEXRAD, the ability to display video from a forward looking infrared (FLIR) camera or other video sources, and a helicopter-specific database with over 7,000 heliports and nearly 30,000 additional low-altitude obstacles in addition to the already extensive obstacle database found in the fixed-wing G500 system. The Eurocopter AS350 Ecureuil (Squirrel) is a single engine intermediate helicopter originally manufactured by A?rospatiale (now part of Eurocopter Group). 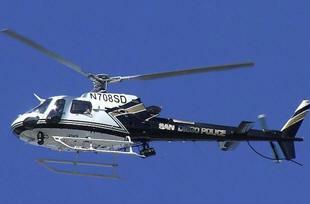 The AS350 is marketed in North America as the AStar. The AS355 Ecureuil 2 (marketed in North America as the TwinStar.) is a twin engine variant, while the Eurocopter EC130 is a derivative of the AS350 airframe.
? Safety analysis and research. As part of Single European Sky-II the agency have been given more tasks. These will be implemented before 2013. Amongst other things, EASA will now be able to certify Functional Airspace Blocks if more than three parties are involved.